Plum Pretty Hicks Design — Plum Pretty Decor and Design Plum Pretty Decor & Design Co. 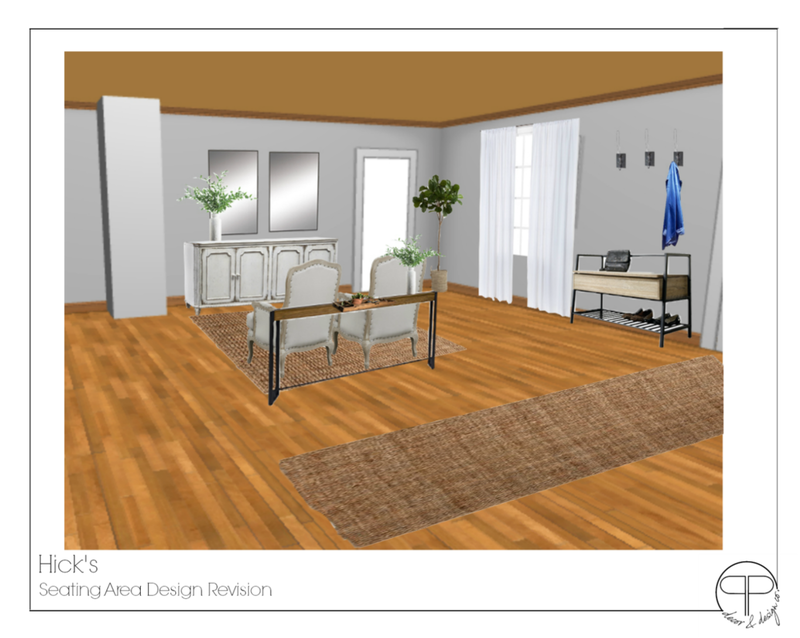 I wanted to make the space feel as cohesive as possible while still giving you a space for dining and living. I also kept everything simple and light to make the space appear larger and more open. Long white drapes that extent from floor to ceiling will make the space feel taller and brighter. I incorporated touches of black metal throughout all the spaces for an industrial farmhouse feel and for a slight masculine touch. I brought in blues with the accent pillows, accent chairs, and the dining area rug- I know you said you really liked blue. 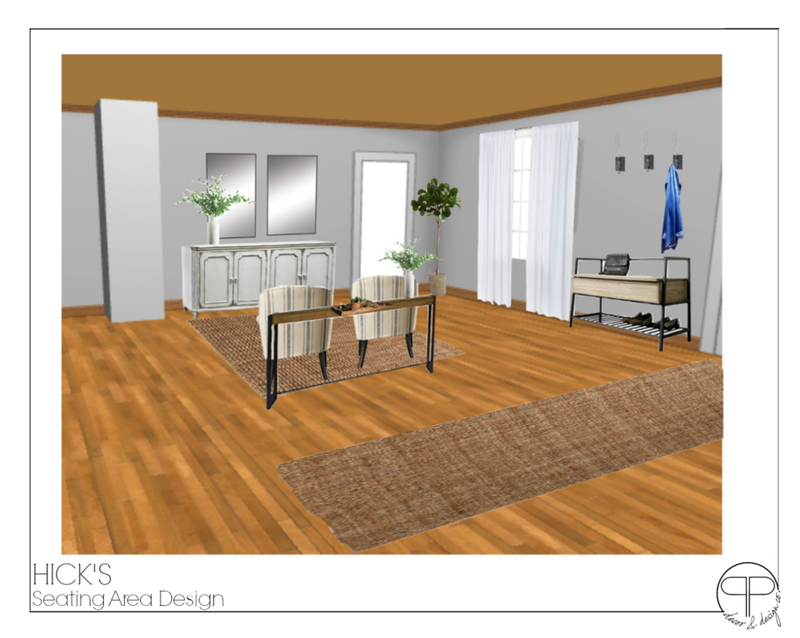 For the entry way I wanted to create an area that served as a foyer in this open concept space. I added a bench with hooks above next to the door that can serve as shoe storage and a place to hang bags and coats. Then as you enter into the space a long jute runner helps welcome you into the cohesive open concept. To the right behind the chairs in the seating area is a console table. Giving you can area to drop you pocket book, keys, mail, etc. This helps continue the entry area into the space. I turned the blank space on the right into a seating area. Sectioning it with a jute rug. I kept it simple with a console for storage and some mirrors on the wall the make the space seem more open. It also give the allusion of window since there is not a ton of natural light or windows. For decor I used simple vases filled with stems. I switched out the accent chairs for some a little more farmhouse/french country. I placed you "living room" area in the back right corner. You can use the sofas you have now. Then purchase new ones later if that is something you want to do. I displayed lighter colored sofas to open the space. I also grounded this area with a jute rug. Added a swing arm lamp for extra light. A swapped out the chandelier for a flush mount light. I also included this really neat TV console. This bring wood up on the wall and provides a nice backdrop for your TV. A round coffee table helps break up the boxiness if the two sofas. I switched out the sofas for the gray option in those slip cover sofas. This will also give you an idea with the darker sofas you have now. I also added the shiplap wall for the tv. If you like this option I can draw up some plans on how to build this. I think it would really lighten the corner up. I also switched out the coffee table for this more rustic wood style table. The floor lamp was replace with a more traditional style. But still swing arm that will provide lighting while seating on the sofa. I layered a cow skin rug over top of the jute for a rustic look and adds depth and texture to the space. I placed your dining area where your living area is currently. This keeps the space feeling open. 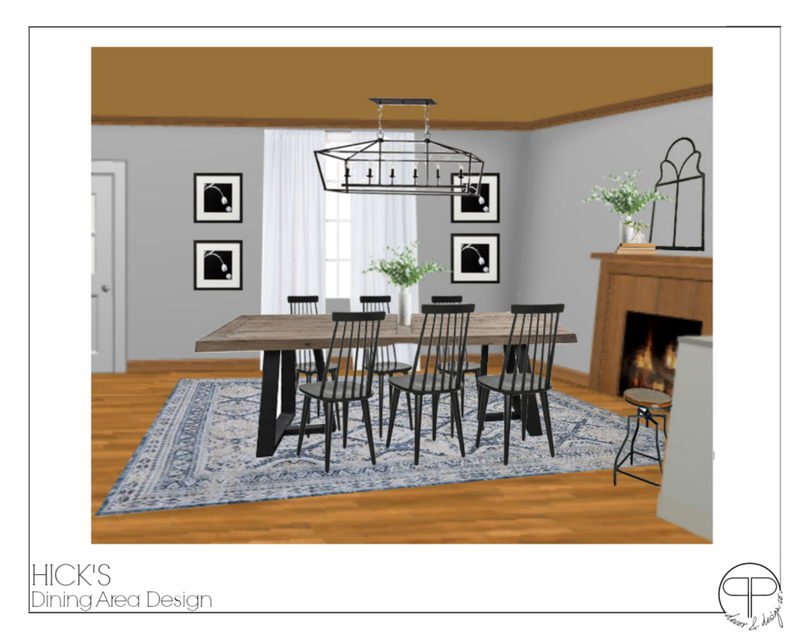 I used a rug with a fun design in this area, a wood and metal table, with black farmhouse style chairs. I also swapped out the ceiling fan for nice black metal light for over the table. I also place three barstools along the back side the the bar. These backless barstools will help the space stay feeling open. I kept the decor above the mantel simple- black frame, vase with greenery, and a stack of books. I also added frame along the wall with the window for displaying your favorite family memories. I switched out the chandelier for a less modern and more traditional farmhouse style. I also switch out the black dining chair for a textures rattan option. 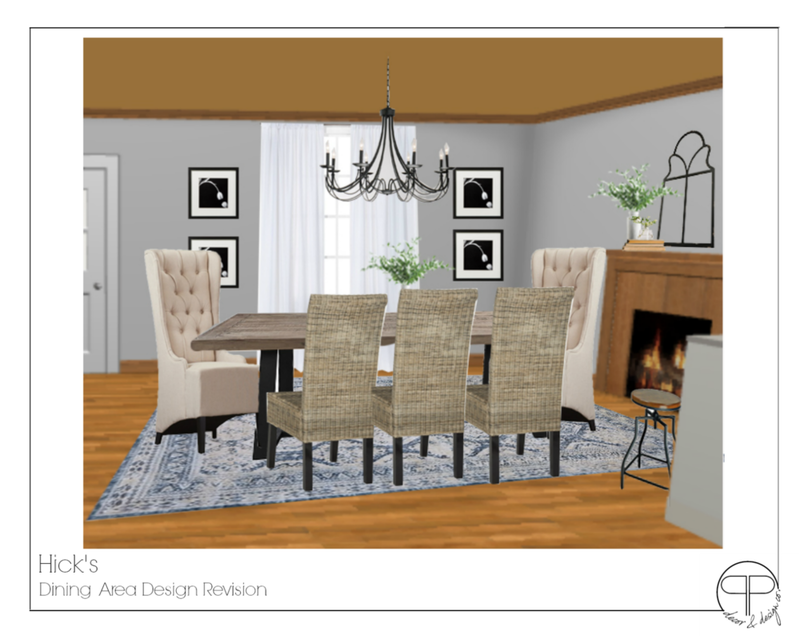 Then place some tufted fabric wingbacks on each hand to soften the place and add some contrast. Let me know what you think about the overall design I came up with for you space. Tell me what you like or what you would like to change in the "Questions, Comments, and Concerns." Please not which area you are referring to (example: Entry Area, Sitting Area, Living Room Area, Dining Room Area). Do you like the overall design of the space?